Anyone who has been using a jailbroken device for a while would be familiar with AirBlue Sharing tweak. It is a fabulous tweak that allows users to share files from iPhone, iPad or iPod touch to users of other devices. 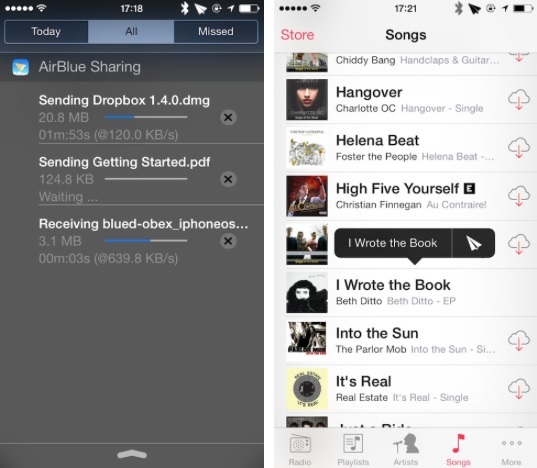 Unlike Apple’s AirDrop feature the AirBlue Sharing is not limited to iOS 7 powered devices and supports a lot more types of files including music, PDF files, videos and more. The latest update for AirBlue Sharing tweak makes it fully compatible with iOS 7 and ARM64 devices that includes iPhone 5s, iPad Air and iPad mini with Retina Display. The implementation of this tweak with iOS is pretty neat and makes it seem like it is a native feature. The current status of the transfer can be seen in the Notification Center for both sending and receiving as seem in the first screenshot above. A small sharing button appears on the pop up can be accessed by tap and hold, allowing users to share a file via Bluetooth. Features of this tweak include native Bluetooth pairing, sharing speeds of up to 1.7MB per second, ability to turn off Bluetooth when transfer is complete, multiple transfers at the same time, support for sharing notes, photos, videos, music, contacts, voice memos, PDF file and more from stock apps. In addition to sharing feature users can also receive files using this tweak. When an import is completed users are asked to choose the application they want to open the received file in from the ‘Open In…’ button. So who can send or receive files from your iPhone or iPad? Well there’s no limit to devices that can pair with your iOS device. Users of Android, Blackberry, OS X, Windows or any device that has Bluetooth enabled can send or receive files from you. This functionality is similar to how Bluetooth used to work on our good old Nokia phones. It is nearly impossible that Apple would ever allow this many sharing options natively on iOS and that’s what makes jailbreaking so much fun and important at the same time. AirBlue Sharing tweak is available as a commercial package and costs $4.99. The iOS 7 and ARM64 update is free for those who already own it.